I feel like the addition of stripes automatically makes clothing 100% more interesting. Thin stripes, bold stripes, contrast stripes, understated stripes? I love them all. 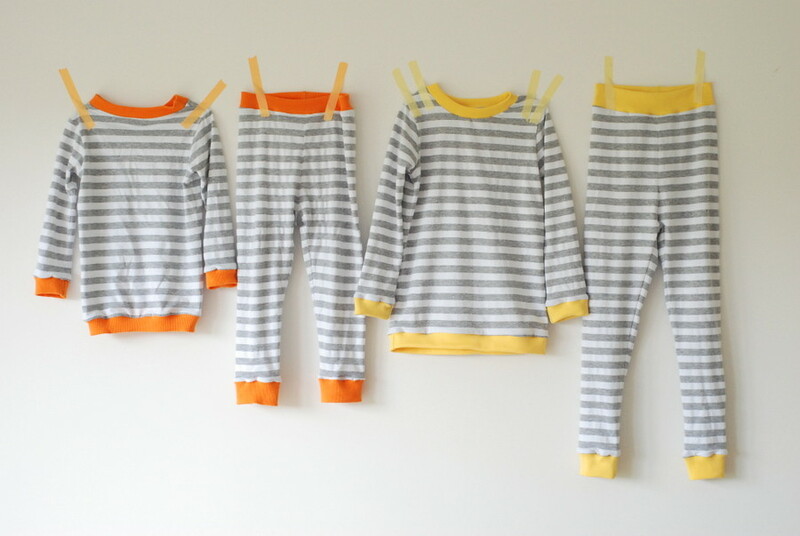 The Show your Stripes Turtleneck is one of many striped tees I’ve made for Elliot (there’re a couple more in this post). They’re always a hit. Striped fabric is pretty easy to find (or make! check out Dana’s DIY-fabric post here! ), which is definitely a plus when it come to sewing for boys. This yellow-and-white striped hoodie is made from a Farbenmix pattern here. And An blogged here about that great shirt with green elbow patches and collar on the right. Top Left: Flashbacks hugging Bottom Left: Flashback with Hood Right: Make My Week, Baby! The middle long-sleeved tee uses a superfun contrast of solid color and stripes; and while the button-down shirt on the right isn’t technically a striped print, the effect is definitely stripey. Laura of Craftstorming blogged these “jimjams” here. The low-contrast stripes on the left are understated, but the solid trims define the stripes. And the notebook page on the right? Genius. Adorable! I love the little kid with the sunglasses posing against the wall…so much attitidude! great roundup! Always tons of love for the stripes. My big question is WHERE can I find some wide striped knit fabric?! I really don’t want to sew my own, and have scoured my local fabric stores, and have yet to turn up something online. Any great ideas? Ashlie – check my “sewing with knits” Pinterest board (link at top right of website)…there’s a link to the shop where I found this fabric in there if you’re interested.